“We all like everything from rock to just crazy out-there avant-garde type music,” Noah says. 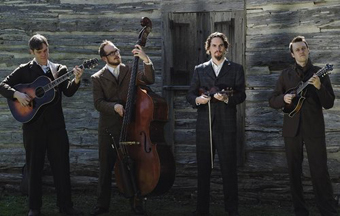 “We try to throw in really any influences that we have in there.” The new album includes mostly originals, along with tracks by fellow Austinites Bruce Robison and Drew Smith, and a rootsy rendition of the Beatles’ “Dear Prudence.” Roy “Futureman” Wooten of Bela Fleck and the Flecktones and Noam Pikelny of the Punch Brothers make guest appearances on the album. Nashville Music News praises the band’s “sophisticated arrangements and fierce musicianship.” For a distinctive acoustic experience that crosses genres, geographies, and generations, ride along with MilkDrive at the Freight.